Dave McKean has done 33 new Mirrormask drawings for the lettered editions of the signed and limited Mirrormask Script book. You can see all the drawings here for free (although it will cost you money to buy the book with the actual drawing it). Click on the thumbnails to see the whole thing. And on the subject of Mr McKean, I am delighted to announce that on Thursday, January 11, 2007 7:00pm at the Walker Art Center, 1750 Hennepin Avenue, Minneapolis, Dave and I will be "in conversation". The Free Verse event "celebrates 20 years of the duo's artistic partnership--Gaiman and McKean will each offer a brief presentation of their own work, then follow it up with an on-stage conversation about the aesthetic challenges they face together and separately." At http://raintaxi.com/readings/ we learn that "while this event is free, tickets are required. Tickets are available at the Walker box office starting one hour before the performance. This event will also be webcast live and archived at channel.walkerart.org. " It's always odd when you read a piece of criticism that tells you nothing except that the person writing it doesn't know what he or she's talking about. Case in point, a recent New Yorker review of the Mary Poppins stage play (which I saw in London a few years ago, and which had a lot wrong with it, mostly in its desire to be part of P.L. Travers' world while never quite daring to step outside the Disney frame it was built in, and many things, lots of them Disney things, that were right with it). But the New Yorker criticism of it seems to be something completely outside of that. For example: After reading the P. L. Travers books or seeing the 1964 film version, starring Julie Andrews, we wonder if Mary Poppins makes the children she cares for better people by being, as she sings near the start of this show, “practically perfect,” or if she’s a Pied Piper-like fantasist who preys on her charges’ escapist wishes. Is it all about her or all about the emotionally transformative effects of love? and, of course we don't wonder, if we've read the books, because it's obviously all about nothing of the kind. At the point where the writer complains that At no point does this Mary Poppins get her hands dirty in a sinkful of Dickensian dishwater, I found myself wondering exactly what the critic in question thinks that Edwardian nannies or governesses actually did. They weren't servants. They were of the family yet not part of it. That was sort of the point. And of course Mary Poppins is not -- in the books -- actually "practically perfect", although that's her own opinion of herself. She's conceited, dangerous, implacable and a force of nature. She teaches the Banks children nothing as banal as moral lessons, and I don't believe that anybody is really emotionally transformed in the books, except for a handful of lucky people in the stories who are given the ability to run away from their lives or are set free from some kind of physical imprisonment (and that occurs more in the stories that Mary Poppins tells the children than in the stories themselves). 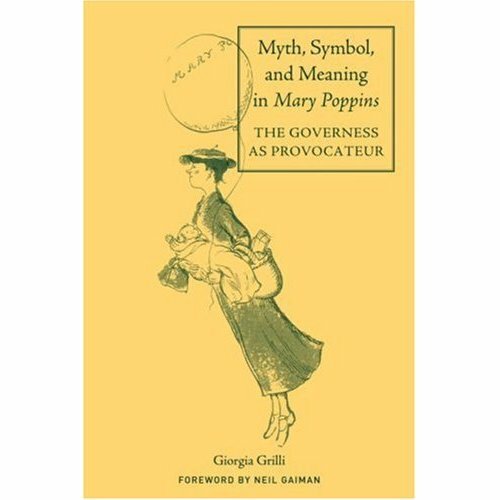 And I wound up thinking about this because I read the extremely dim New Yorker review on the same day that I got my copies of Myth, Symbol, and Meaning in Mary Poppins - The Governess as Provocateur, a wonderful and brilliant book-length study by Professor Giorgia Grilli about the nature of the Mary Poppins in the books and about magic and shamanism and what nannies and governesses were, and how precisely and deeply subversive a figure Mary Poppins is.